When Can My Baby Use a Booster Seat or High Chair? 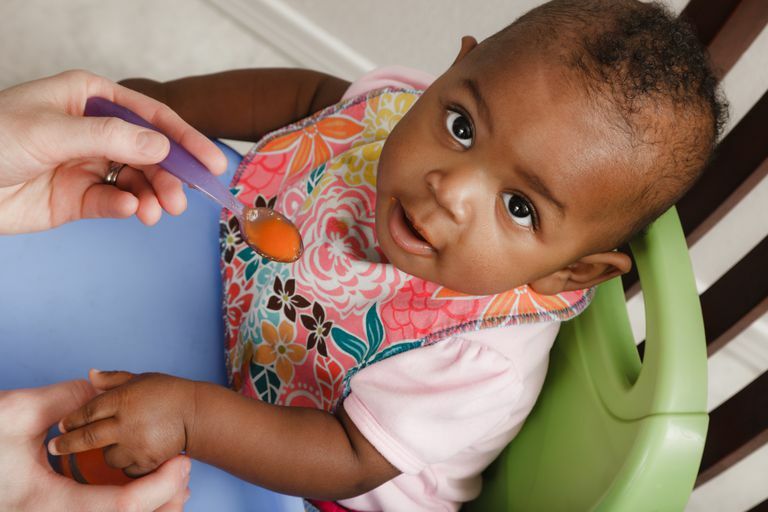 If you don't live in the most spacious of digs, high chairs can take up a surprising amount of room. For example, if you live in a small apartment with cozy, eat-in kitchen, you might be eagerly awaiting the day your son or daughter can transition to a space-saving booster seat. But when is the time right? There are all kinds of booster seats on the market. Some are really basic and have no straps or back support, and aren't intended for babies younger than 1 year old. Some, like those designed for travel, don't have a tray or lock system that helps keep the baby upright. Other booster seats are designed for slightly younger babies. These kinds of booster seats have firm back support, a seat belt and other fastening straps. Next time you're out browsing the feeding gear aisle or are shopping online, be sure to take note of the manufacturer's age guidelines. Depending on the product's guidelines and your baby's physical development, it might be possible that your child will be ready to downsize to a space-saving booster seat at or around 9 months of age. There are many types of booster seats on the market now that are designed to be convertible high chairs for small spaces, so keep that in mind if you're on a budget. But in general, most babies are able to use booster seats well before their first birthday as long as they can sit up on their own. By the time your child is 18 months old, they will likely be able to sit in all types of booster seats. The major benefit of booster seats is their portability. It would be ridiculous to lug your high chair wherever you go, but a booster seat is lightweight and easy to take to family gatherings, restaurants, etc. Your own booster seat is a much better alternative to a restaurant's dirty, germ-infested high chair. Clean up is also a breeze. Many booster seats are made of plastic, so there's no need for soaking or scrubbing stubborn food particles. Simply detach the tray, wipe it off and you're finished. A booster seat also allows your child to feel included with the rest of those seated at the table. If your child tends to fuss or throw tantrums during meals, you might find that seating them in a booster seat completely changes their disposition. Sometimes little ones overestimate their independence and try to get in and out of high chairs on their own, which can easily tip over and cause injury. A booster seat can't tip over like a high chair, and the straps mean you can secure your child in place. You want to be sure you're following the safety guidelines when using the booster seat, so read through the product manual before using it. Certain booster seats have specific requirements, i.e. the seat has to sit upon a hard surface, not a cushion. Only use a booster seat if your baby can sit up unsupported. Always secure your baby using the belt restraints. You may also want to look for a booster seat with a crotch guard that helps keep your baby from slipping. Only attach the booster seat to a sturdy, stable, heavy chair that won't tip over. A booster seat should never be attached to lightweight, plastic chairs or folding chairs. Always keep the booster seat securely attached to the chair. Keep the booster seat far away from walls or other objects that your baby could kick off of and topple over. Never leave your baby unattended in the booster seat. Always follow sound feeding advice.